2Interuniversity Centre for Astronomy and Astrophysics, Pune, India. Received 19 October 2010; revised 23 November 2010; accepted 26 November 2010. Entropy is a measure of how disorganised a system is. 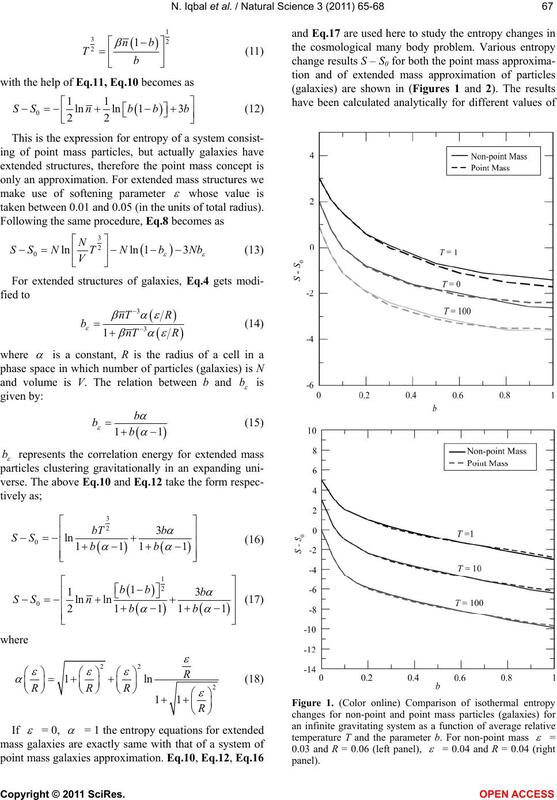 respect to the measuring correlation parameter b = 0 – 1.
potential energy and the momentum among the particles. zation of this clustering is a problem of current interest. correlation function and r is the inter-particle distance. 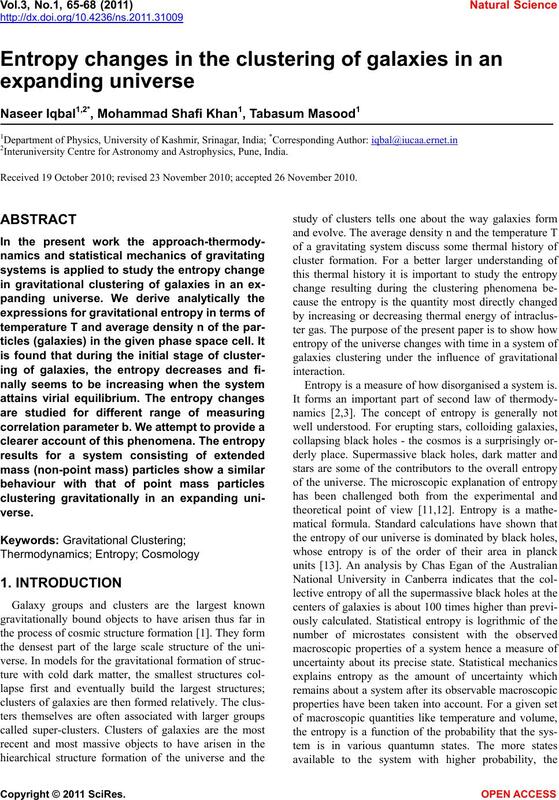 found to be equal tools in describing entropy of a system. where N! is due to the distinguishability of particles. taken between 0.01 and 0.05 (in the units of total radius). for different sets like 0.04 and 0.05.
less same except with some minor difference. in gravitational galaxy clusters in an expanding universe. 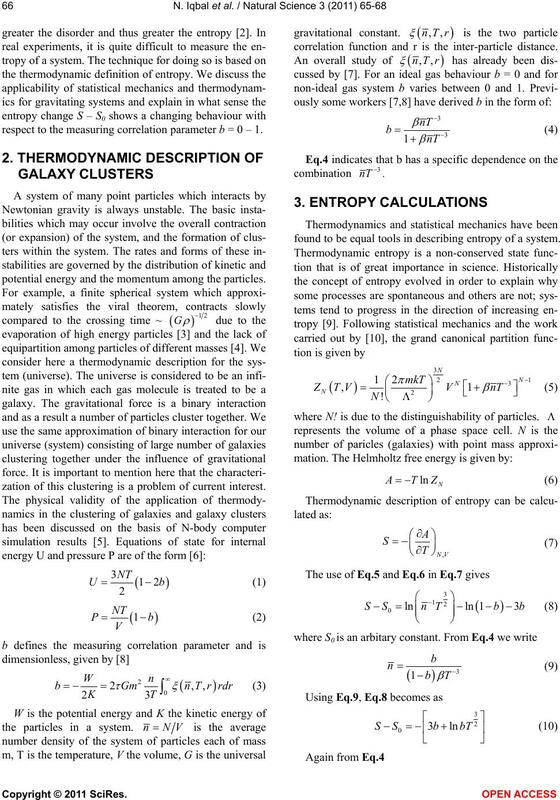 theoretical calculations as shown in Figures 1 and 2.
that the universe is different than scientists had thought. during the course of this work. galactic nuclei. 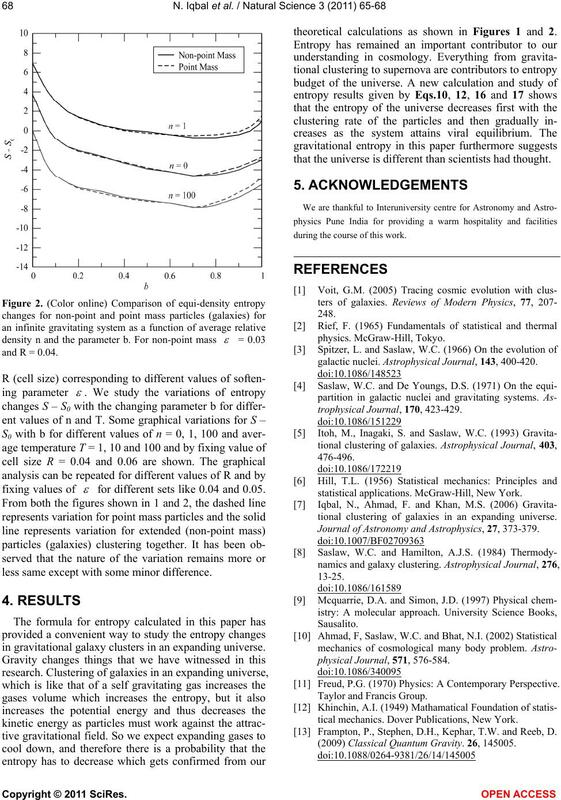 Astrophysical Journal, 143, 400-420.
statistical applications. McGraw-Hill, New York. tional clustering of galaxies in an expanding universe. Journal of Astronomy and Astrophysics, 27, 373-379. Freud, P.G. (1970) Physics: A Contemporary Perspective. tical mechanics. Dover Publications, New York. Frampton, P., Stephen, D.H., Kephar, T.W. and Reeb, D.
(2009) Classical Quantum Gravity. 26, 145005.